Snow and ice are not for everyone, but you’ve likely made the best of it if you live in a northern state. And when the only ice rink in town opens its doors for winter, you’re one of the first to lace up those skates. This is the only time of year that you get the chance to deftly glide across the ice, impressing those little kids with your ability to skate backwards. You even crash into the bully who had been knocking small children out of your way. And, you know what… You don’t feel too bad about it. Everyone in the place even watched him hip-check some other kid, giving the poor soul a swollen ankle when he twisted it. This is an opportunity to shine, so you’ve decided to go big or go home. Despite those initial apprehensions, home is not an option. Now, you crouch down and zoom around the rink, quickly gaining speed and gearing up for your axel jump—something you haven’t done in about (Oh!) a decade. Just as you begin to lift off, the realization hits you that is was a very poor choice. You try your best to reverse course, but it’s too late. And you’ve landed squarely on your ankle. The pain is so sharp that you barely notice the bully point and laugh; you barely muster a whispering “Be quiet, kid” at him. Oh, karma! Oh, oh, horrible irony! It’s a Saturday, so you figure that your chances of receiving medical treatment are slim, but you’re wrong. FastMed Urgent Care is open every day of the week all year long. This makes it easy for you to be treated for any sports-related injury, even if you’re not an athlete. Maybe you’ve never hurt your ankle ice skating, but you’ve probably injured it another way once or twice before. 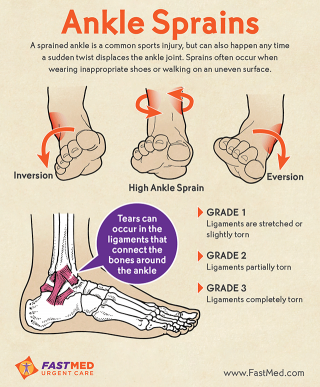 Ankle sprains are a common injury among adults and children. In fact, every day in the U.S., 25,000 people sprain an ankle. If you have a swollen ankle and think it may be due to an ankle sprain, come to your local FastMed Urgent Care for an examination. Ankle injuries don’t always happen during doctor’s office hours, that is why FastMed is open early in the morning and late into the evening. Our dedicated staff of medical professionals will have you back on your feet in no time! Located in Arizona? Check out our list of FastMed Sports Medicine clinics.